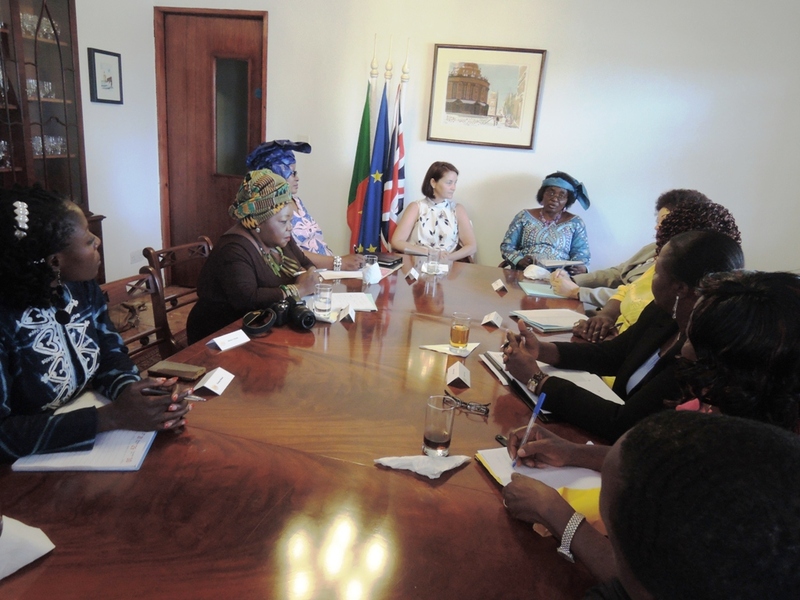 Cameroonian Female Legislators to visit the United States. 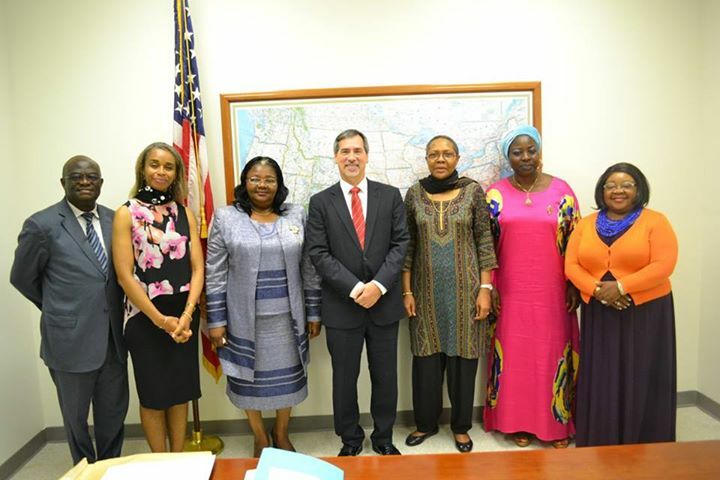 On October 22, 2015, Ambassador Michael S. Hoza welcomed to the U.S. Embassy in Yaounde the distinguished Members of Parliament, Vice President Monjowa Lifaka, Ndam Njoya Patricia and Chiabi Honorine; and Senator Paulette Bisseck. These women leaders are part of a strong team of female legislators who will visit the United States of America this fall for an exchange program titled “Women and Politics” under the International Visitors Leadership Program (IVLP) sponsored by the U.S. Department of State. “Thank you for honoring us by your visit and for taking time from your schedules to travel to the United States for a special exchange program along with your colleagues, especially with an imminent Parliamentary Budget session.This program is one of my top priorities. I hope that you will be able to share your accomplishments and challenges with your counterparts in the United States and on return serve as an inspiration to all Cameroonian women and girls. We also look forward to concrete programs and actions to rid infant mortality and enhance the health of women and girls when you return,” Ambassador Hoza told the legislators. Vice President of the Parliament, Monjowa Lifaka, thanked Ambassador Hoza and the United States government immensely for this great initiative and opportunity which will enable them to hone and enhance their leadership skills. “I would like to see how successful women leaders in the United States mentor the next generation of aspiring female leaders and explore ways that I might be able to implement such efforts within my constituency when I return.” Honorable Ndam Njoya, very passionately, reassured the Ambassador that she will specifically pay keen attention to legislation in the United States that deal with the protection of women’s rights. Senator Bisseck on her part expects to build on lessons learned to re-energize the existing women’s caucus in the Senate and Parliament in Cameroon. 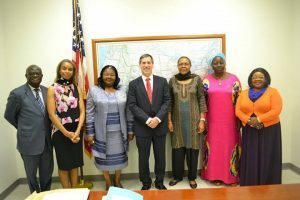 “We look forward to an extremely enriching experience and are ready to learn and also to share our experiences as Cameroonian female legislators during our visit to America and bring back beneficial tips which we can share within our constituencies,” they said. During a briefing session that ensued, Political and Economic Officer, David Brownstein, Political Specialist Jaques Kateu, Cultural Affairs Officer Merlyn Schultz and Cultural Affairs Specialist, Gladys Viban, took turns to inform the distinguished legislators on their program outline. During their stay in the United States, the legislators will have firsthand information on constitutional, judicial and legislative processes and practices that promote gender equality and protect women’s rights; examine American women in leadership positions, how they have achieved their success, how they sustain their efforts and explore innovative ways in which women globally have overcome roadblocks that would have impeded the achievement of their goals or advancement in their professions.